This weeks project is a doozy! For something so small, these sure took a long time and loads of paper! Now, I hope I’m not turning anyone away already. Bear with me! I think the result is pretty adorable. This week, follow me as I make a quilling paper hydrangea topiary! This post contains affiliate links. If you click on the links below and make a purchase I may receive a small compensation to help me finance this site and keep coming up with awesome tutorials and tips! There’s no cost to you and I only ever include links to companies and products that I trust and work with on a regular basis. We were thrilled because we had to leave another hydrangea at our last home that Mr. Craftery had grown from a baby plant. When I saw this new plant, I was reminded of the mini hydrangea topiaries I’ve seen across the internet and I knew I could make a quilled version, too! The first thing I did was to grab some graduated quilling paper, because I wanted to mimic the two-tone shades of real hydrangea flowers. Graduated paper has one color on the end and moves into another color along the strip. The kind I chose has white on both ends and changes to a deep color in the center. I grabbed some packs of the Opal Green from Quilled Creations and also the Purple from Paplin for my topiaries. There are many more colors available. Check out all the options at one of my favorite suppliers, Custom Quilling by Denise! Because I wanted white centers to all my hydrangea petals, I ripped each strip into two right at the center. Keep in mind that the graduated paper may be shorter than other types of quilling paper and often comes in packs of 50 strips. For each of these topiaries, I ended up needing 3 1/2 packs of paper! Start with the hydrangea petals. Roll each strip of graduated paper into a tight coil, making sure to start rolling with the white end. Each coil will now have a white center and gradually change to a darker edge. Pinch each petal into a teardrop. Dip the petals into some Tacky Glue to help set the blooms quickly. Full disclosure: You will need a ton of these and the pinching will start to hurt your fingers. I found it easiest to glue two petals together and let that set for a moment before adding the other two. Now, make about 14 million of these petals. I’m exaggerating… a little. But you will need many, many, many petals. It’s also a good idea to glue some petals in groups of two and three. These will come in handy if you need to fill in some spaces as you’re gluing the flowers to your topiary ball. After you’ve made all the hydrangea flowers, gather the supplies you will need for the rest of the topiary. I was able to pick up the mini terracotta pots, the foam balls, and the floral foam at my local Dollar Tree! This is one of my favorite crafty money-saving tips ~ you’d be amazed at what you can find sometimes in the craft aisle at a Dollar Tree. You’ll also need a toothpick to use as the stem of your plant. This can be painted green, but I have tons of floral tape, so I did a quick wrap with that. I left the ends raw since they weren’t going to be seen. If you’ve never worked with floral foam, it’s very easy to cut and holds it’s shape nicely. Use a craft knife to cut a small rectangle off the larger block, then shave the corners off so it fits in your flower pot. Beware, it does leave a light dust behind when it’s being cut, so make sure you wipe that away when you’re done. 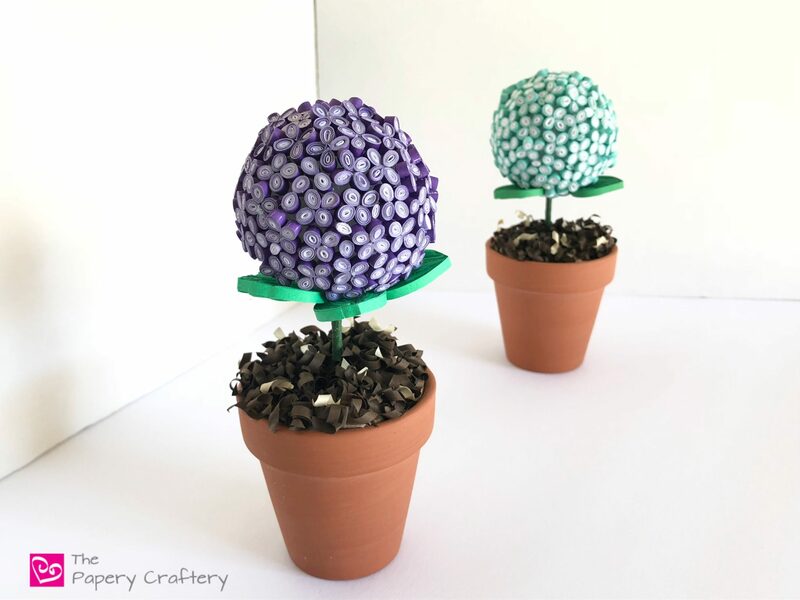 The styrofoam balls will be the base of your hydrangea bloom. I’m using balls that were just shy of 2″ and they ended up working really well with the mini pots. Cover your styrofoam with your hydrangea flowers, making sure to glue them as close as possible. Some will stick up a little, and that’s just fine. I also added a few broad leaves to the bottom of my styrofoam ball. They were attached with Tacky Glue and pinned until dry. I recommend letting your leaves dry and then adding petals around them, using tweezers if necessary. The goal is to cover the styrofoam with as many petals as possible so it looks really full. This is where those groups of two and three petals will come in handy. I also needed to add individual petals here and there where I thought I had too much open space. Once you’re happy with your petals and leaves, use your toothpick to connect your ball to the floral foam in your flower pot. Because I wanted mine to look as realistic as possible, I added paper soil. Use the spiral technique on dark brown and tan strips of paper. Then snip them into very small pieces. Squeeze loads of glue onto your floral foam and mound them up. I did add a little brown kraft paper in the gaps between the foam and the sides of the pot so the soil would have somewhere to sit there, too. That’s it ~ quilling paper soil! If you look closely you can see where I added really tiny teardrops to fill in some gaps. I experimented with on my purple quilling papery hydrangea topiary and added a second layer of leaves. All in all, I’m pretty happy with the results of these topiaries. But I did learn some things along the way! Next time, I think I would use slightly larger leaves. I seriously misjudged the amount of time and paper these teeny plants would require. I had to reorder the strips twice! It was fun to play with graduated quilling paper strips, though. I hope this post inspired you to do the same! What would you use graduated quilling paper for?